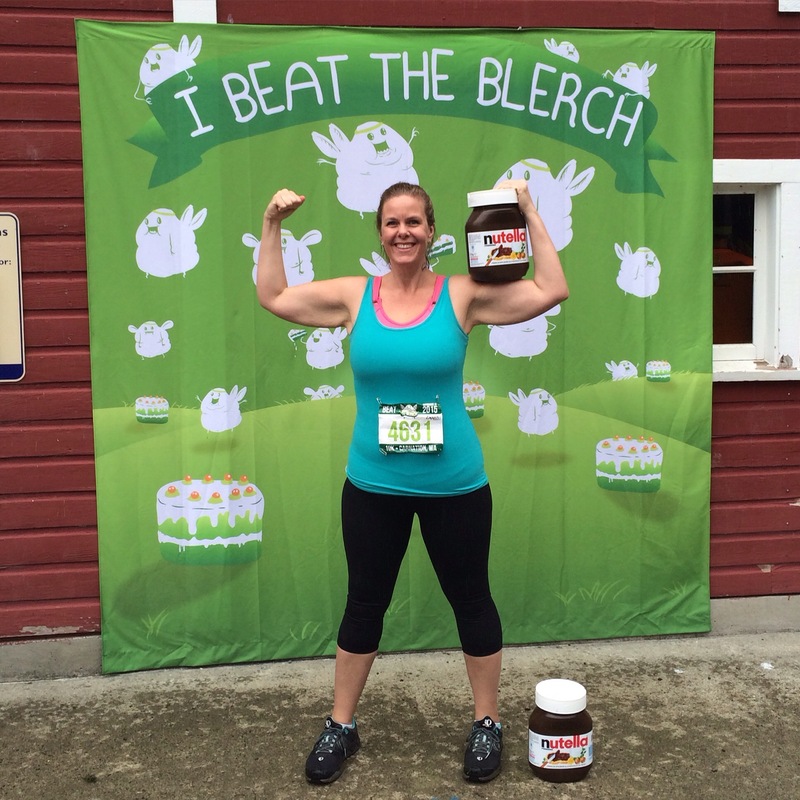 I Beat the Blerch! – Tamara Shazam! I was excited beforehand. Like, ridiculously excited. It’s true. And it was totally worth the brouhaha. I never thought I’d be that guy. You know- the one paying $55.00 for the ‘privilege’ of running silently along a trail with 1000 other people on a drizzly, Sunday morning and calling it the best time ever. Never, in a million years! But it was! After crashing out at 8:30 the previous night (fist week of school will do that to a girl), I woke up at 2am to drink water to make sure I’d be hydrated, then at 5:00 I bounced out of bed, full of vigor, ready to hit it! We arrived at the race over an hour early. I thought there’d be traffic, but really there was just a lot of standing around, looking at the Nutella sandwiches and looking for The Oatmeal author, Matt Inman, who was bounding around in a bright-green, inflated sumo suit. I thought I took a picture of him as I passed the care station during my run, but I really just ended up with a fantastic picture of my palm. Of course. Before the race I was lucky enough to run into some old friends of mine from childhood, Denise and Mark, who also ran the 10K and a colleague of mine, Jessica, who I’m also running the half marathon with next month, so I spent some time chatting with them and chasing Jude around the barn until the race time arrived. When the run finally began, it was lovely! Paved and gravel, flat, no hills to speak of and plenty of room to run. And there was something about the spirit of the run. That we were all there for the Blerch, because The Oatmeal brought us together, there was just something kinder and more forgiving in the crowd… If that makes any sense. Like, we had an understanding. We didn’t talk, but we shared something in common. They started marking the mileage at two miles, and true to their word, there was a rest station at three miles stocked with water, gu, Nutella sandwiches, cake, cliff bars and blerches with bigfoots on couches! It was pretty crazy! I quickly sat down with my bearded Blerch, he wrapped his arm around me and told me I didn’t need to run. I could stay riiiiight there. But I hopped up and bounded back the other way down the trail. I’m so proud of myself. SO PROUD OF MYSELF. My goal was to run the entire distance, and except for that brief and blerchy-selfie-sit-down, I ran the entire 6.2 miles without stopping. 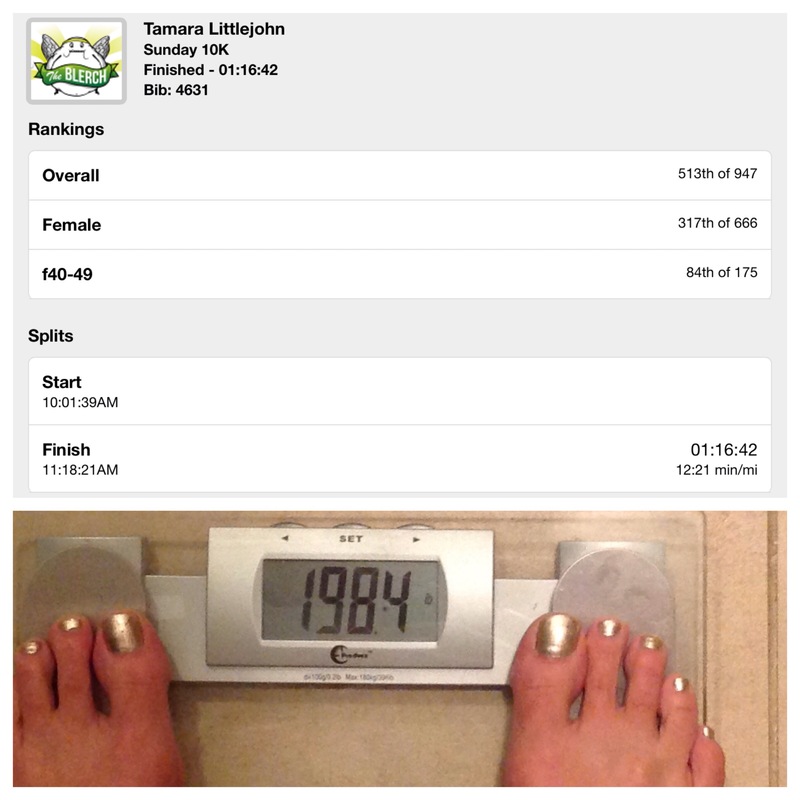 My numbers were not fantastic, my average mile was in the 12’s, oddly enough, but I did it*. I made it. 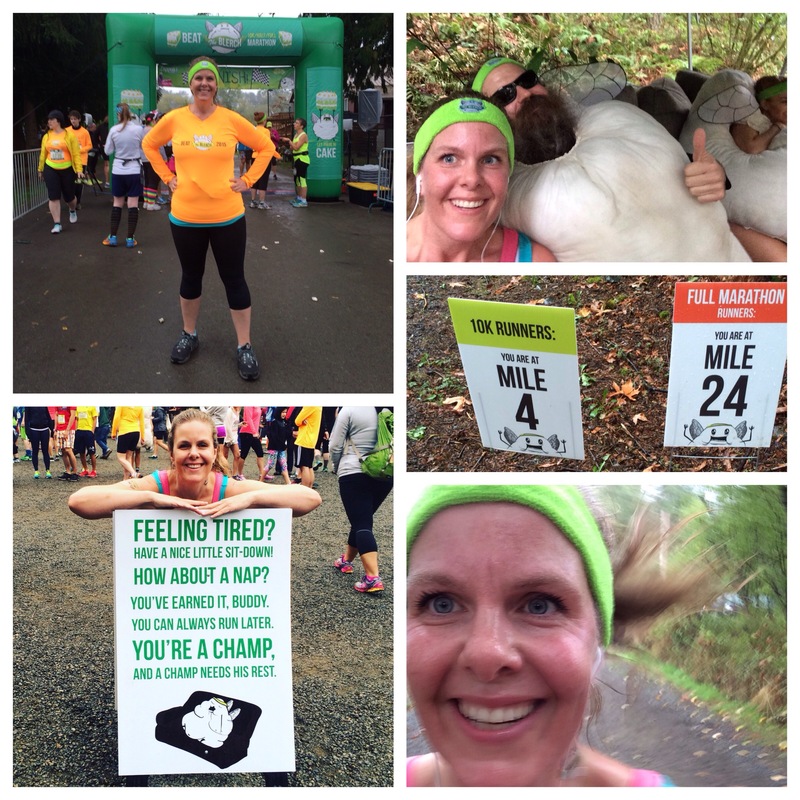 I beat the Blerch! Afterwards there was indeed cake and other junky food, but I can’t eat any of that right after a run; I can’t even drink water right away! So all that glory that was lost on me had to be bestowed upon my kids, who were altogether too happy to eat my cake, chips and running gels for me. I looked around for the mythic purple drink, but alas, there was none to be found. I heard a rumor that there was some the previous day. Those blerches drunk up mah purple draaaank! That’s ok. I’ll just have to go run it next year! I read in the post-event email today that they’ve already made reservations for next year! And Gigi wants to run the half marathon with me! We’ll be beating that Blerch again, come this time next year! *Of course Strava crashed during the run, so I can’t even compare numbers. I say odd because I was able to use Strava for the second three miles and my splits were in the 11’s and I felt a lot faster during the first half of the run… Ah well. So glad you had so much fun! You did great! And you look great too!